Well, here we go again. When some of these dark and dismal days are rapidly overtaking my cheerful thoughts, the only thing I can do is to sit down with a warm cup of tea, put my feet up and day-dream, imagining my Christmas Wish List 2015. Obviously top of my list is my families safety and happiness – they are precious to me. But after that, it doesn’t do any harm to dream up a fantasy Christmas Wish List, and hope that maybe just one of the items will appear, wrapped up beautifully, on Christmas Day. So what’s Number One on my list. Something I can’t live without! My Matthew Rice Calendar. The “Year in the Country Calendar”. 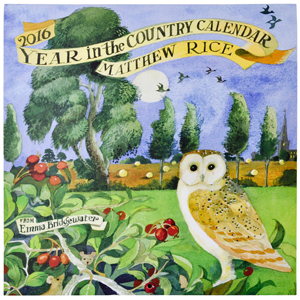 I confess that I have bought one of Matthew’s Calendars for many, many years, and also for members of my family. I just love the sketches, the humour, the tips and the big spaces for noting down important anniversaries, birthdays and appointments. Just have a look at the cover of this Calendar for 2016, and see what I mean. Matthew Rice is the incredibly talented husband of Emma Bridgewater, and between them they have created one of the UK’s most popular companies. Following on from Matthew’s passion for animals, chickens and nature are a series of items that will brighten up anyone’s kitchen. And what goes with a good cup of tea? Why, biscuits and a slice of gooey cake, of course. But where do we keep them? 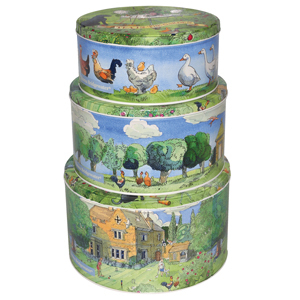 What could be better than this set of three colourful cake tins? These collectors items are very practical, and can’t fail to make you laugh at the wonderfully humorous depictions of wild life. Matthew’s passion for these chickens, ducks, foxes and nature overflows into these kitchen accessories, and are a joy to have on my kitchen shelves. Even on a damp November afternoon, they brighten up a dark corner of the kitchen. Not to be forgotten is this fabulous steel tray, big, substantial in fact, 38 cm (15 inches) diameter, and with two strong handles to help you carry cups of tea and cakes or Champagne and nibbles in great style. I was lucky enough to receive a present of Matthew’s big tray last Christmas, and love having it up on the wall – I also found it very handy for carrying food and glasses out into the garden in Summer. 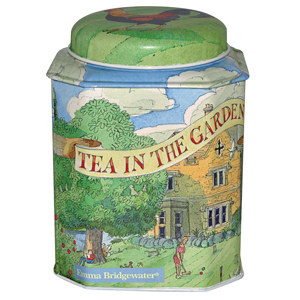 The designs of all Matthews tin products changes usually ever year, so there is always something new to look forward to. 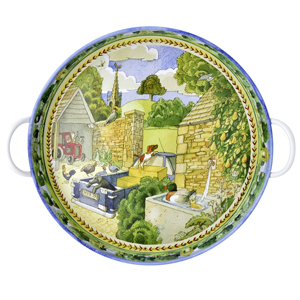 But for my Christmas Wish List 2015, I’m sorely tempted by some other items from Emma Bridgewater. Her collection of patterns, tableware, glassware, mugs and kitchen textiles grows ever bigger. There is such incredible variety. Here are two very different styles of tableware from the Matthew Rice items you have seen above. 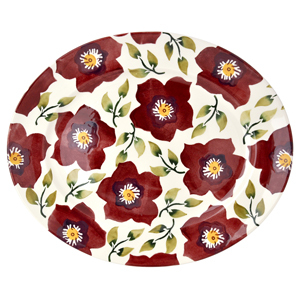 This is from the ever-growing collection of tableware entitled ‘Christmas Rose’ from Emma Bridgewater. This pattern obviously comes into it’s own at this festive time of year, and the jugs, mugs, plates, bowls, tureens … in fact a plethora of gift items etc. make a fabulous present all year round. But to be honest, the richness of the colour is just perfect for Christmas. 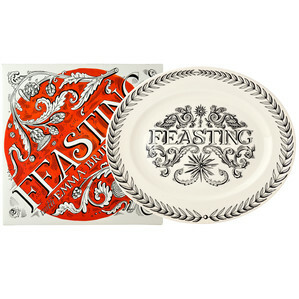 ‘Feasting’ is a fairly new addition to Emma’s Black Toast range of tableware. A lot of Black Toast is modern, designer style, bold but simple. But the pieces in the ‘Feasting’ range are festive fun, and a welcome addition to those who want a slightly softer feel but still in black, to suit their kitchen or dining room. I think this is a very handsome platter, 30 centimetres or almost 12 inches across, and would make a fantastic present for someone (no hints there then!) It would go brilliantly in my soon to be new kitchen, painted already in silver-grey. I can see it up on my shelf already! To have a look at the items above, just click on the coloured wording and it will take you straight through to the items and the Emma Bridgewater site I haven’t put any prices on, as I find that many companies are giving discounts year round now, so it’s best to have a look yourselves. Don’t forget that Emma delivers almost all over the world (well, not Emma herself, if you know what I mean), but do check final delivery dates and costs. It’s time to go and see if my great builders have finished grouting the floor tiles in our new extension. The tiles we chose look even better than we anticipated (thank goodness for that!) I will be putting more pictures on soon. Also time for me to light the log burner. I will be dreaming up more cookware and items for my Christmas Wish List 2015, so do keep a lookout. Keep safe and keep warm.